Select the number of cameras you would like in this system. 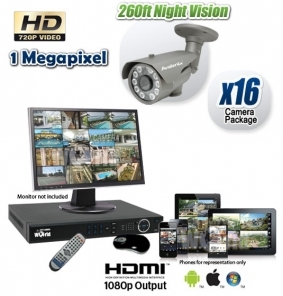 High Definition Long Range Infrared Camera System that supports up to 16 HDCVI cameras. In this package we provide our top of the line 16 Camera DVR that records HDCVI cameras up to 720P resolution in Real Time 480fps without any frame skipping. This is right now the best long range infrared camera system money can buy for around its price point because there is no other that offers 260ft of night vision in complete darkness. We've picked our best HD infrared bullet camera and combined it with one of our best HD security DVR recorders. You can select above how many cameras you would like to purchase. This system can meet the needs of a 16 camera system, a 12 camera system, all the way down to a 1 camera system with capacity to record at total of 16. 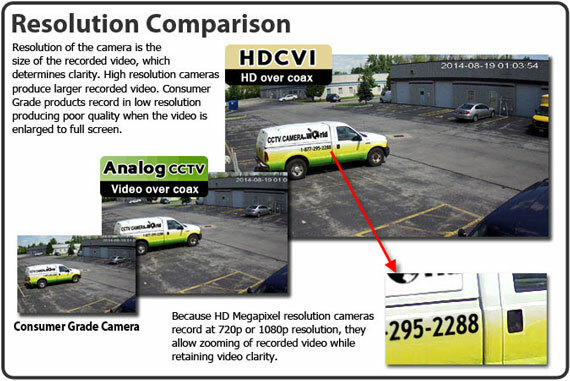 The cameras have a 1 megapixel video sensor that allows output of 720p video to the DVR, and they have a 2.8-12mm Lens that can be adjusted manually to attain a wide 90° view for general surveillance of a property, or be zoomed in to a specific spot at a 20° view. Be sure to watch the youtube video example above to see the camera in action. The long range infrared night vision cameras are rated at IP66 for being weather proof in rain and snow, and can be mounted on a wall, pole, or ceiling. The built-in bracket can articulate to almost any angle.